It’s often said that the police are the “thin blue line,” the fragile wall standing between the public and unrestrained anarchy and crime. But within the realm of policing there is no more despised or guarded assignment then Internal Affairs. The domain of Internal Affairs is filled with lies and betrayal, a world of squealers and snitches, wires and wiretaps, shadowy surveillance and covert operations. By necessity officers of Internal Affairs have to operate in the shadows, in secret, separated from their fellow officers. Good cops who recognize that the work they do is essential, are happy they don’t have to do the job themselves. But without these brave, honest, and faithful officers, the thin blue line would most certainly collapse from within. 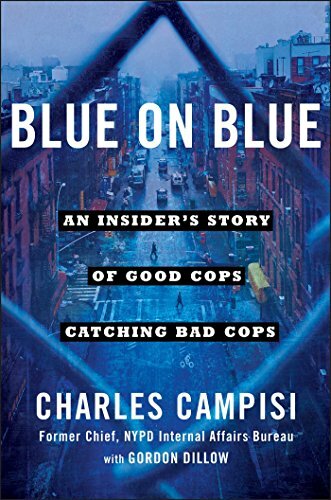 In Blue on Blue: An Insider’s Story of Good Cops Catching Bad Cops, author Charles Campisi, a recently retired chief of the Internal Affairs Bureau for the NYPD recounts his 40-year career of flushing out crooked cops and combating police corruption. With assistance from veteran reporter and journalist Gordon Dillow, Campisi offers a fascinating and illuminating description of his career within the NYPD from a lowly rank and file officer in some of New York City’s most crime ridden precincts to his reluctant acceptance of head of the Internal Affairs Bureau (IAB). With aggressive support from superiors, Campisi sought ways to alter the IAB’s bad reputation. During Campisi’s 18-year tenure (1996 to 2014) at the IAB the number of people shot, wounded, or killed by cops declined by almost 90 percent, and the number of cops failing integrity tests shrank to an equally startling low. But to achieve these results wasn’t easy, and Campisi had to triple IAB’s staff, hire the very best detectives, and put the word out that bad apples wouldn’t be tolerated. Although he concedes that eliminating all significant police misconduct is virtually impossible, he emphasizes that the majority of cops do their work professionally and honorably. Campisi’s narrative is thought provoking, and as an ultimate insider he offers the reading public a rare glimpse inside one of the most secretive branches of policing. Within its pages, he recounts the most critical cases that put the IAB to the test and which ultimately helped clean up the department. Charles Campisi’s Blue on Blue is a compelling behind the scenes account of what it takes to investigate police officers who cross the line between guardians of the public to criminals. It’s a mesmerizing exposé on the harsh realities and complexities of being a cop on the mean streets of New York City and the challenges of enforcing the law while at the same time obeying it. The breadth and depth of experience of the author and his unwavering commitment to justice makes this a refreshing read that will most certainly enthrall true crime enthusiasts and those interested in the history of modern law enforcement and particularly how police misconduct is handled.